Today is our last day in the UAE. In the blink of an eye seven splendid days have passed us by, before we knew it we were coping with the arduous task of organising and packing our large cargo bags. In a week we experienced almost everything that Dubai and Abu Dhabi had to offer both old and new. Our trip could not have been possible without the meticulous planning, thought and care put in by Ginny and Sern, to whom we are eternally grateful. From Bur Dubai to Burj Khalifa, from Dubai Creek to Dubai Mall, from Madinat Jumeirah to the Lehbab Desert, from Mina Zayed to the Grand Mosque of Sheikh Zayed, from Al Ain to Mount Hafeet, not a day has passed that our five senses were not fed with a feast of sight, sound, smell, taste and touch. We also hoped that we were worthy accomplices to the brilliant mad hatters of tour guides that are Ginny and Sern, frantically dashing here and there squeezing every ounce of fun into each thrill-a-minute action-packed day. Our last day began with a real treat: Ginny and Sern were taking us out to dine at an Emirati restaurant serving authentic local breakfast cuisine. We arrived at the personal rapid transit (PRT) station at North Car Park station where Sern parked his car. Here we all got in a driverless emission-free electric pod car that will, after a short ride dock at the Masdar Institute of Science and Technology, Masdar City’s first tenant. The buildings here are designed and positioned to use natural forces — wind and shade — to cool outdoor spaces and draw people outdoors, even in hot weather, just as ancient dwellers did. Walking into Masdar City from the still air outside, you immediately feel a strong breeze. The cooling effect is amplified by shade from the buildings, supplemented by the overhanging rooftop solar panels. Wind towers, high walls and courtyards – all of these natural ways of getting around the problem of constant heat inspired Masdar’s creators. The 45-meter high wind tower close to Masdar Institute is another return to the knowledge of ancient Middle Eastern architects. wouldn't it be cool to actually live here? The terra cotta buildings overlooking this plaza are residential, with heavily shaded terraces that encourage use of outdoor space at home. found themselves a wish tree? We then arrived at the site of our genuine Emirati breakfast. 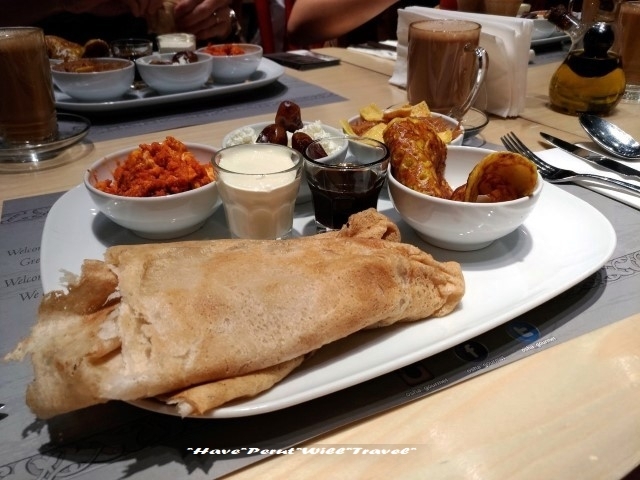 Situated within Masdar City Osha Emirati Gourmet offered casual dining set in a ‘majlis’ like ambiance and prides itself for providing ‘Emirati Fusion’ cuisines. We were seated outside at first, but a large swarm of flies put paid our plans to enjoy our breakfast outdoors. The restaurant has light, wooden square tables, contrasted by bright-red chairs, in the small dining area. There are also a handful of private ‘majlis’ seating areas that can be closed off with curtains. Two bright-red chic chandeliers hang over the ‘majlis’ area, while artwork on the walls depicts scenes of Arabian life from years gone by. The contrasting concrete floor and exposed black pipes finishes off the ‘fusion’ effect to give it a trendy, industrial feel. Ginny and Sern proceeded to order the house specialty, the ryoog osha which is an Emirati breakfast with balaleet, chebab and egg with tomato and chami dates. After breakfast we continued to explore the area and learned that the International Renewable Energy Agency (IRENA) took over the other major building here for its shimmering steel headquarters. IRENA chose Abu Dhabi as its base, after Masdar City promised a state-of-the-art sustainable building. The six-storey headquarters uses only one-third of the energy of comparable office buildings in Abu Dhabi – thanks to air-tight insulation and high-efficiency elevators. We fervently hope with all our hearts that Masdar City will not turn into an abandoned dream of a zero-carbon city. Next up, Ginny and Sern took us to their default shopping mall each weekend. Located at Yas Island (a man-made island) Yas Mall is the largest shopping complex in all of Abu Dhabi. This huge mall offers a wide selection of shops and outlets, in addition to restaurants offering different and delicious cuisines. The mall is spacious and airy, walking around was very comfortable. For added measure it is adjacent to Ferrari World and a big water park. Ginny and Sern offered for the three of us to spend some time at Ferrari World, but the sheer price of the admission tickets scared us silly and besides, we’d like to spend our last day here with them instead of gawking at overpriced Italian sports cars that we’ll never afford to own anyway. We spent the entire afternoon here just ambling along doing some window shopping, and even participating in some cosplay (costume playing) at a booth that provided Emirati wardrobe complete with headgear. We even came across a troupe of ‘street-performers’ that performed everything from ballet to break dancing. Later that night Ginny and Sern ordered take-outs from the same restaurant we visited this morning for breakfast, Osha Emirati Gourmet. This time we opted for a selection of their Mutabban Biryani Chicken and Mutton which is a dish of long grain basmati rice cooked and simmered with their very secret gravy of aromatic spices, served with spicy tomato sauce and yoghurt. We thought that this was indeed a good representation of authentic Emirati spices and flavours and a good introduction to authentic Emirati cuisine for the uninitiated. All good things must come to an end: we’re leaving on another jet plane later tonight. Thus ends our Arabian Nights, Arabian Days adventure in the UAE.